ZUG, SWITZERLAND, August 10, 2018 /EINPresswire.com/ — #MetaHash, a MultiPoS consensus blockchain and decentralized real-time application platform, is happy to announce the signing of a strategic partnership with Ian Balina – one of the most influential blockchain and cryptocurrency investors and a prominent advisor and evangelist – and 100X Advisors, a full-service blockchain advisory firm. 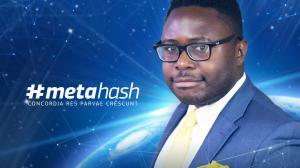 Ian Balina and the 100X Advisors team will support #MetaHash in furthering its growth and development, as well as expansion around the globe in key markets of the Americas, Europe and Asia. The strategic partnership includes the acquisition of #MetaHashCoins (#MHC) by Ian Balina and 100X Advisors from the Round A allocation. Ian Balina is a well-known crypto leader and a regular crypto spokesperson for The Wall Street Journal, Forbes, CNBC, Huffington Post, The Street, Inc. and Entrepreneur Magazine for his work in analytics, cryptocurrencies and business activity. With the opening of its MainNet on June 29, 2018, #MetaHash started distributing #MHC prior to its upcoming start of forging initiatives. In comparison to mining, forging does not require sophisticated hardware, thus making it more accessible to consumers. The protection of the network consensus arrives from the value of the network native coins, which can be easily utilized to rent any common web-server; even a home PC with good internet connection can be used. Owners of #MHC will become the first nodes contributing into the network’s growth and enjoying the full advantages of the early forging, scheduled for the third quarter of 2018. To view the whitepaper and get more information including crowdsale terms, please visit metahash.org. You can also check the company’s Medium blog, Facebook page and Telegram chat. The platform, based on its unique #TraceChain protocol, offers unparalleled speed, security, and decentralization at the lowest price per transaction in the history of blockchains. Signaling the future of the distributed web, #MetaHash is among the pioneers of blockchain interoperability, allowing networks to interact and integrate with each other.